The aim of this project is to experiment with the creation of a counter-hegemonic travelogue and alternative cartographies of lived space. I work comparatively on Arizona and Palestine where migrations, dispossessions, genocides and revisions weigh heavily on how embodiment is interpreted and expressed. Mentors and professors have cautioned me in the comparison of these places; the occupied territory of Palestine with Israel’s routine and rampant displays of brutality and oppression against Palestinians must not be conflated with the relative peace of the southern Arizona desert. Yet, the more I travel through and research these two regions, the more undeniable their similarities as colonized lands. In both places, most blaringly, there is the wall. But the separations and segregations can be read as much more than the heavily militarized borders; the built environment and aspirations of those in power manifest their ideologies in even the most banal spaces of residence and leisure. And where the soil has nary a minute to scab or heal because the bulldozer is always prepping the next storied plot for a sub-development, hotel or parking lot. 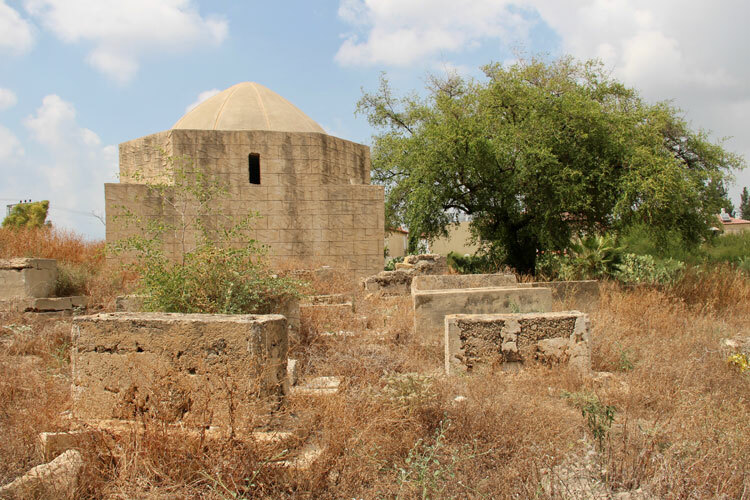 This two-part reflection tours the Sheikh Murad cemetery in the south Tel Aviv neighborhood of Shapira and Charles Clore Park along the Mediterranean shore, built upon the ruins of al-Manshiyya, also in southern Tel Aviv. In both places, I extensively photographed the minutiae of the sand, soil and flora in an attempt to document what feels like the final moments before another layer of colonial concrete is laid over this land. After several weeks of pressing various gallery owners, curators and artists, I finally got the answer I had anticipated this whole time. Its the south, the south is just not important. I have been in Tel Aviv doing my doctoral research, learning about how art spaces and art making generate sites of internal and external borders within the city. Specifically, I am interested in neighborhoods like Florentin, Neve Sha’anan and Shapira; the ways in which these now blighted sites are at once rife with demographic threat, as expressed by the Likud government, and where real estate speculation and redevelopment is beginning to boom. South of Salame, motorcycle and metalwork shops are increasingly ousted for contemporary art galleries and vegetarian-friendly restaurants. An Israeli architect took me on a walking tour of what he sees in Shapira. At one point he deemed it like a utopia. A utopia, I reflected, where virtually zero signage indicates the Palestinian land ownership and communities/businesses that once thrived upon this reinscribed space—now bustling with Jewish Israeli millennials. Buildings not yet demolished, presently appropriated as nightclubs, coffee shops and high-end luxury apartments…the “Arabesque” architecture a great lure for foreign investors and local bohemians alike. A utopia, I remember, where Israel’s Interior Ministry forbids African asylum seekers of all employment,1 and where these migrants are perennially under threat of physical and psychological violence and/or deportation. He seems to think that because a couple cafes employ or serve a few of the Eritrean and Sudanese asylum-seekers, and because two rows of affordable housing were erected, a distinct kind of coexistence is now palpable; a worthy model for other cities. We turn right at the corner after the synagogue that blares sermons from loudspeakers—to rival if not cancel out the mosque’s muezzin—and arrive at a two-foot wide opening where the chain link has been cut. I follow him reluctantly into the thicket of thistles, worried about the likelihood of ticks and the repercussion of getting caught in this act of entry. I soon realize we are in a cemetery, which he’s surely already announced. Maybe he mentioned what usually grows and when, but I can barely hear the stories he’s reciting many paces ahead; he tramps over what I think is akoub and tombstones with reckless abandon. The grasses are dormant and everything is drought-beige. It’s all dead, anyway. He goes on about how junkies and thieves are the only ones who visit here. What about the buried bodies’ descendants? What birds nest in the lone palms? I couldn’t keep up because my steps were too cautious, and I tried to take photographs of chunks of marble and limestone askew to subdue this sensation that I would never see this site again. In between fumbling with my camera and my questions, I recalled the Sonoran desert in Arizona that I call my home -- how easy it must be for developers to justify upheaving agaves and ocotillos, pouring slabs of sidewalk over the watershed, when blooms and greenery can be scarce in between the monsoon seasons and so much seems parched, if not hostile in the heat. 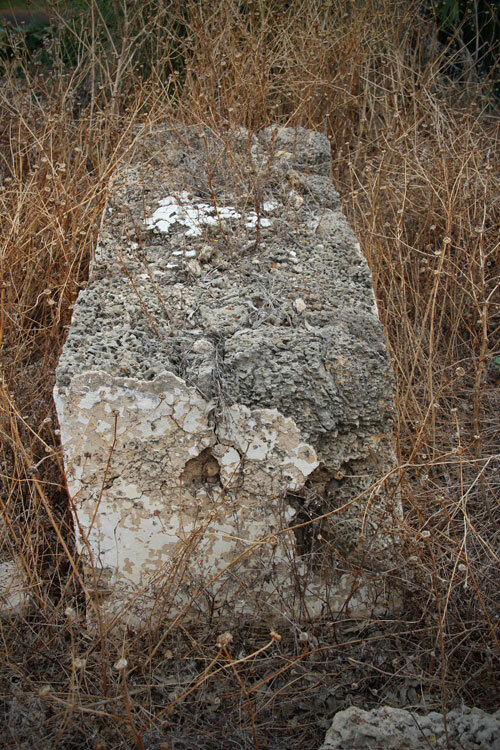 As he exited the cemetery and hopped down a few rocks to street level, I caught up enough to hear his bit about the sand that had been scooped from the Mediterranean shore and leveled all the way up to the demarcation where we stood. From the sidewalk, the gravesite is now a good five to seven feet higher than my head. 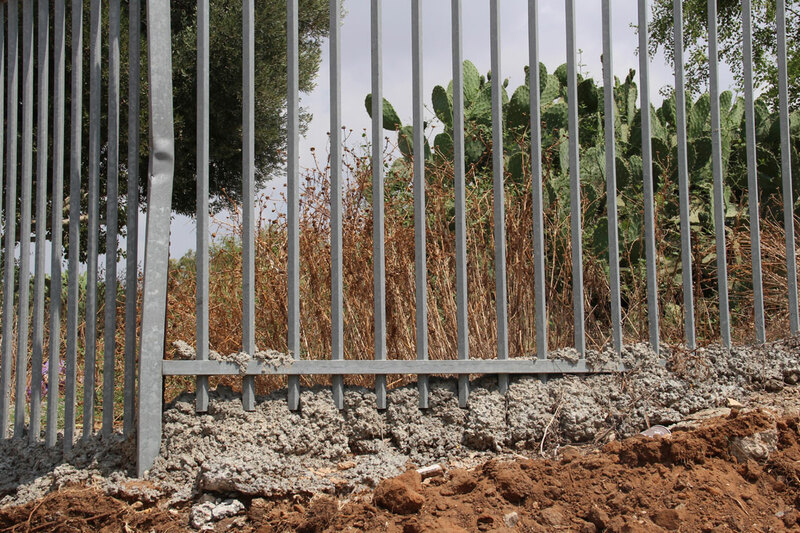 A retaining wall of concrete was erected to keep the soft earth from spilling onto the newer roads. When I returned to my hotel room to decompress from the day, I scrolled through uploaded images. What was the cemetery’s name again? I have to write it down so I don’t forget. Presuming a geotag would come to the rescue, I zoomed in around the block where we walked. No luck, no names. I zoomed some more—noticing nearby parks and even small alleys had such designations. 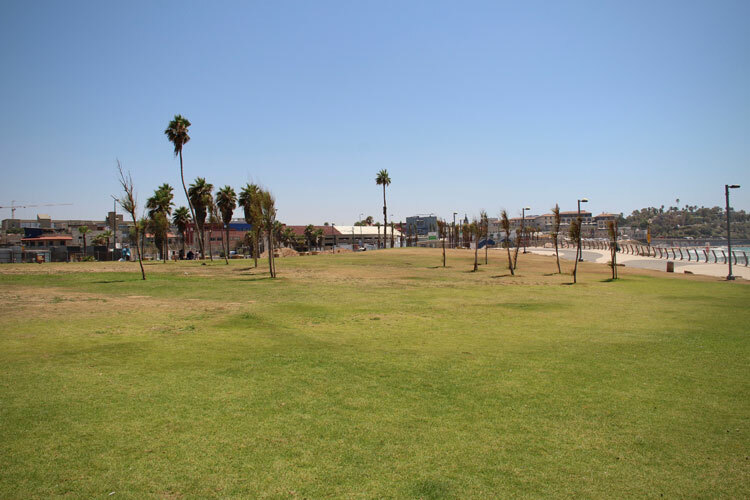 Panned in as far as possible, it became overly evident this is a space that the municipality does not want you to recognize. 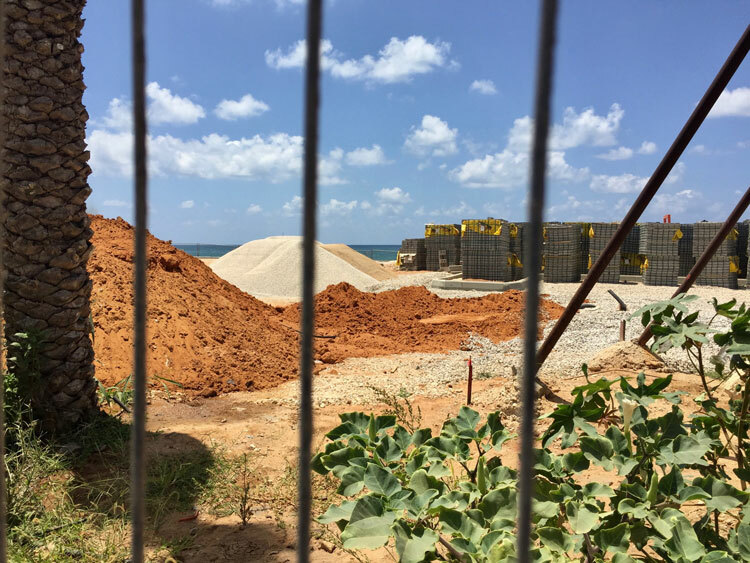 It’s just the end of the block; an empty plot awaiting revitalization… the next new batch of condominiums are on the way…south Tel Aviv is happening. This will be the latest hip spot to live/work/play. 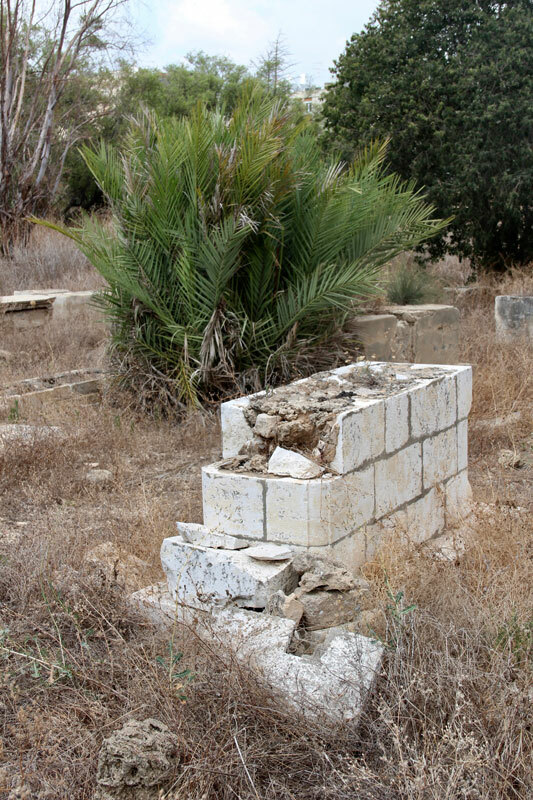 But more online searching eventually allowed me to recall that it was called Sheikh Murad Cemetery. By now, it feels routine to happen upon historically Palestinian territory throughout Tel Aviv that is unmarked by didactic, map or plaque. It is a purposeful ambiguity, a cartographic erasure that keeps the hordes of tourists and travelers away. Zero commemoration or encouragement for the lives that have passed through, lived on and now reside under this land. Nothing to see here so often precedes the annexation, razing and rebuilding with aims of producing a new hot destination marketed for many to consume. I had to revisit this space, this time alone and at a slower speed. The urge to document everything kept me awake during the interim nights. My heart raced as I approached the same fence, this time without a guide to defer any blame or guilt of trespass. I envisioned myriad kinds of confrontations. I shouldn’t have entered. I found a kind of sick reassurance in the mantra of remembrance. Hopefully my photographs can be the smallest stand-in; as I’m convinced the site is slated for demolition in the not-yet-advertised near future. I kept trying to frame the photos so as to not include the coffee shop, home appliance store or gas station in close proximity. The glaringly enormous menorah façade on the Sha’ar Asher Synagogue across the intersection. The tenement-style blocs along the east end, buttressing Ayalon Highway. Or any of the orthodox Jewish homes lining Yisra’el mi-Salant Street; their metal shutters sealed tightly even when there’s no sun shining. 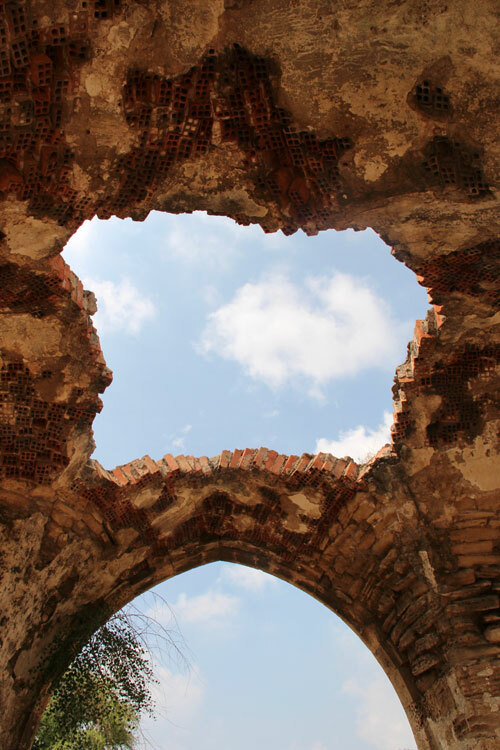 There was no vantage point free of the terra cotta tiled roofs—on all four sides, surrounded to the point of suffocation. The sabr, likely once marking the northern edge of the cemetery now dwarfed against settlers’ sheet metal and barbed wire barricades. I plucked one of the crimson fruits from a cactus pad, and popped it open with my thumbnail. 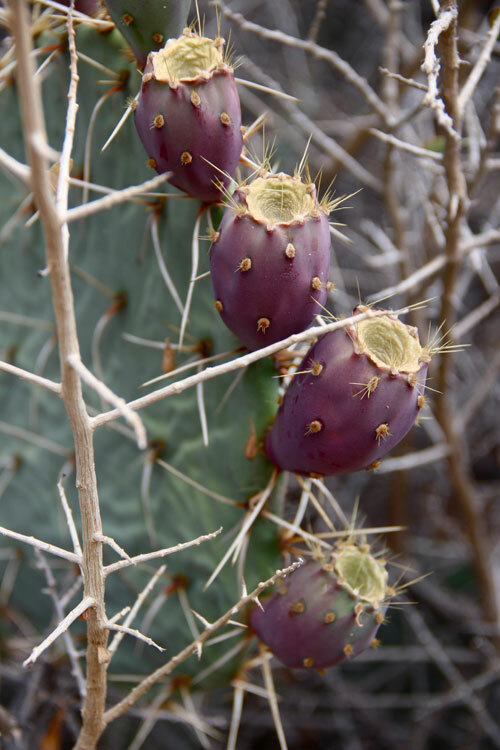 The nopal, as it’s known throughout the Sonoran desert, has myriad uses including serving as nutrient-rich food source. The tuna fruits well-ripened from the thick July heat, magenta juice barely pooled between my fingers. I couldn’t eat it and placed it back on the ground nearby. The sun and rain’s intensity and the brute force of bandits made almost all engravings illegible. So I don’t know with whom I shared this snack. In coming years the surface of this space is bound to be further bastardized. But I am certain those seeds will outlast the cement. The scene at which I was staring is unrecognizable from this description of life as lived before the Nakba. Artillery shelling, annexation, dispossession, demolition, redevelopment and spatial segregation since (and prior to) 1947 have produced a site that is rife with crumbling sandstone and silicate. Presently, the sweltering air smells of metallurgy and exhaust pipes. Several ramshackle structures appear to be caving in on themselves; the real estate sharks’ signs are there, waiting on the buildings’ last breaths. I strayed from the intersection to weave through a few dead-end alleys. Urgency washed over me – see, touch, photograph whatever’s here before it’s flattened. I found my way into a printing warehouse, which doubles as a contemporary art gallery, and chatted for a few minutes with the gallery owner. She told me that the building was formerly a restaurant-turned-auto mechanic’s shop for the Jaffa port workers in the mid 20th century. During renovation for its current iteration, they needed to dig, and kept digging, because the floor was so saturated with motor oil. 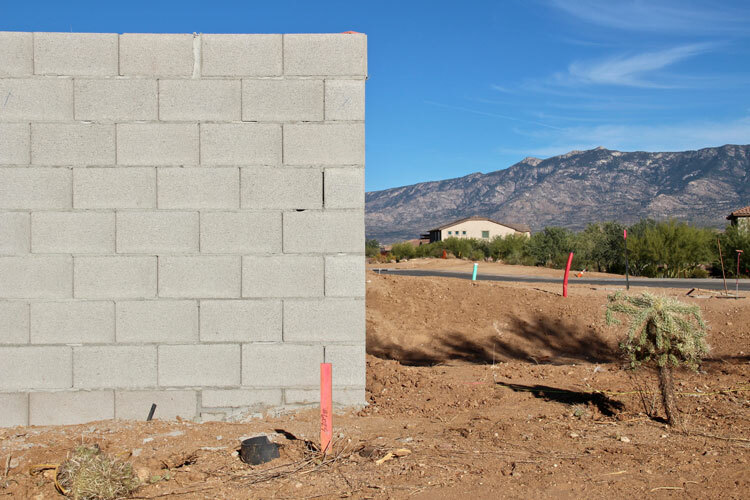 I lost concentration midway through her tale, fixated on what must have been discarded during this transformation, and what was illegible to the backhoe’s hasty grabs, and hers. After leaving the gallery, I stood in the lot, and turned my attention towards the sea. Or rather, everything that cluttered the path to it -- an extra wide sidewalk, then four lanes of traffic, a paved bike lane and then another cluster of construction. Excavators tore at the bluff above the beach and stacks of cinderblocks, rebar and sewer pipes were there on-call in preparation for another parking lot. 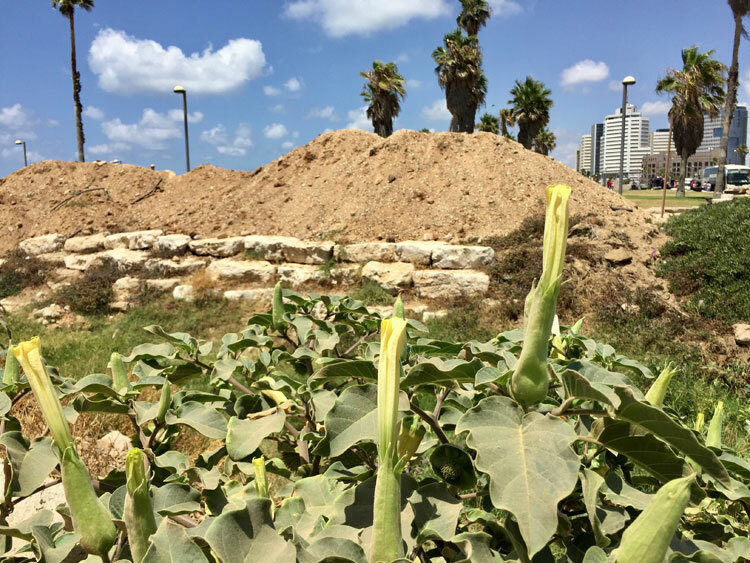 Through the metal fencing, my eyes were drawn to the Datura plants sprouting boldly from the sand, a day or two away from being in full bloom; dazzling flowers that resemble a full moon. 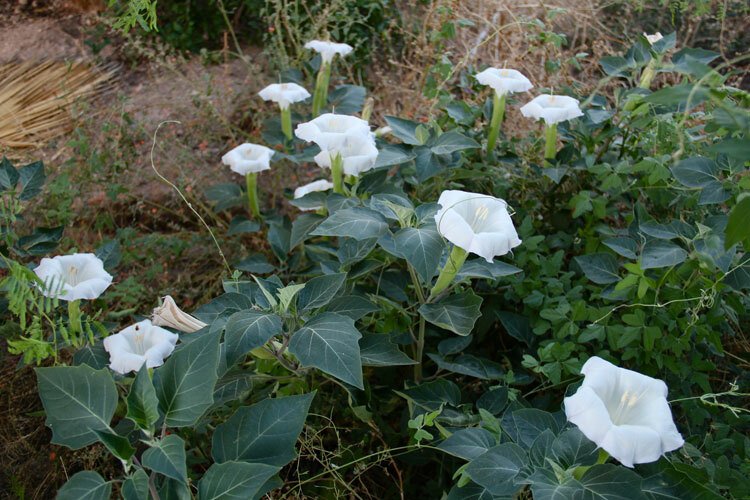 Datura wrightii, also known as jimsonweed or nightshade, thrives in sandy or calcareous soil and is in abundance across the southwest United States. I have seen it growing on roadsides across Arizona and also throughout Palestine but was startled to see huge mounds of it thriving on this section of coast, despite such difficult conditions. Cut and threw my horns away. Cut and threw my feet away. And they drop with flapping wings. With opening and shutting wings. Singers of these songs took images of the auspicious white flower, cut from deer skin, and applied them to victims’ bodies so as to encourage restoration and peaceful human engagement with the natural world. Datura grow in my backyard in Tucson too. And now each morning when I go out to tend our chickens and survey our tiny plot, I’ll be reminded of this plant’s tenacity; rooting and stemming exactly where it needs to be in al-Manshiyya despite the coating of construction dust— behind the atrocious metal barricade that serves no purpose besides seclusion from the sea. Beneath my closed eyes, I see the plant rooting so intricately that it will regrow no matter how many times it is plowed over. In that same quiet pause, I am convinced I will soon know a liberated Palestine and an Arizona where indigenous sovereignty flourishes. Imagined and materialized outside their present colonial realities. There are many others who can visualize this better than I. But I am here, trying. Although the asphalt will soon be laid, completing this newest lot for Charles Clore Park, I am confident the Datura will find its openings from which to come forth and thrive. It is a vigorous perennial. Taylor Miller completed her BFA and MA in Art and Visual Culture Education at the University of Arizona. As a PhD student, her research interests include the contemporary cultural and political geography of Palestine. Her transdisciplinary projects incorporate photography, poetry and critical architectural and urban theory. 3. Nabhan, G. P. (2004). Cross-pollinations: The marriage of science and poetry. Minneapolis: Milkweed Editions.